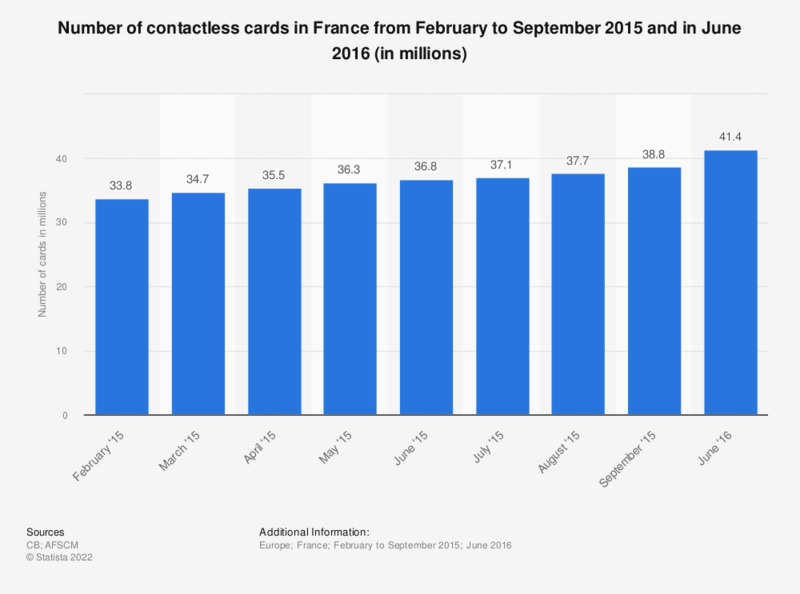 This statistic shows the number of contactless cards allowing for contactless payments in France from February to September 2015 and in June 2016. There were approximately 40 million contactless cards on the French market in June 2016. Statistics on "Credit and debit cards in the United Kingdom"
What steps are you taking to prevent card fraud from happening to you? Which of the following methods of card fraud have you heard of? United Kingdom: Which of the following applied when you took out your main credit card? United Kingdom: Which of the following reasons made you choose your main card? United Kingdom: Do you know your credit card limit amount? United Kingdom: Do you know your credit card late payment fee? United Kingdom: Do you know your annual (credit card) fee rate? Where do you normally keep your credit or debit cards? Where do you store your PIN number? How do you feel about using contactless credit or debit cards? How many contactless credit or debit cards do you have? How often do you use your contactless credit or debit card? In the past three months, have you seen, heard or read about debit and credit cards that have smart chip technology? How recently did you experience debit or credit card theft or fraud? Have you experienced debit or credit card theft or fraud? In the past 3 months, have you been asked for a PIN or signature when making purchases with your smart chip card? Do any of your current cards (debit or credit) have smart chip technology? How likely are you to switch your primary card to one that offers smart chip technology? When did you first receive a debit and/or credit card with smart chip technology?